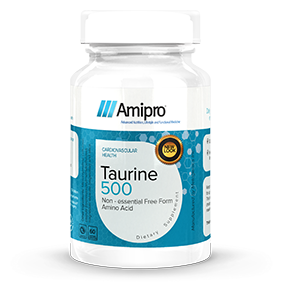 Taurine is a free form amino acid which assists in transporting materials across cell membranes, helps regulate sodium, potassium, calcium and magnesium levels and helps regulate the nervous system and supports cardiovascular health. Promotes cardiovascular health, insulin sensitivity, electrolyte balance and immune regulation. Found abundantly in healthy bodies, but may be lacking in certain vegan/vegetarian diets. Disease states including liver, kidney or heart failure, diabetes and cancer can all cause deficiency.